The Taylorian is delighted to be hosting an exhibition celebrating the work of Yoko Tawada, DAAD Writer in Residence at St Edmund Hall for two weeks from 19th February 2017. The exhibition has been curated by Masters student Sheela Mahadevan (MSt Modern Languages), with the help of DAAD-Lektor Christoph Held and Professor Henrike Lähnemann, and will run for the duration of Tawada’s visit. 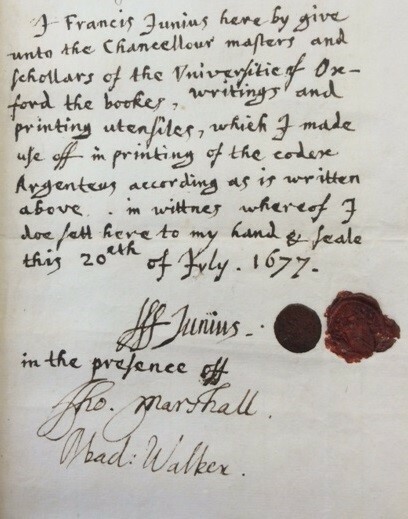 It is open to holders of a Bodleian Reader Card. This blog post is an abbreviated version of the exhibition catalogue prepared by Sheela Mahadevan. Yoko Tawada was born in 1960 in Tokyo, Japan. 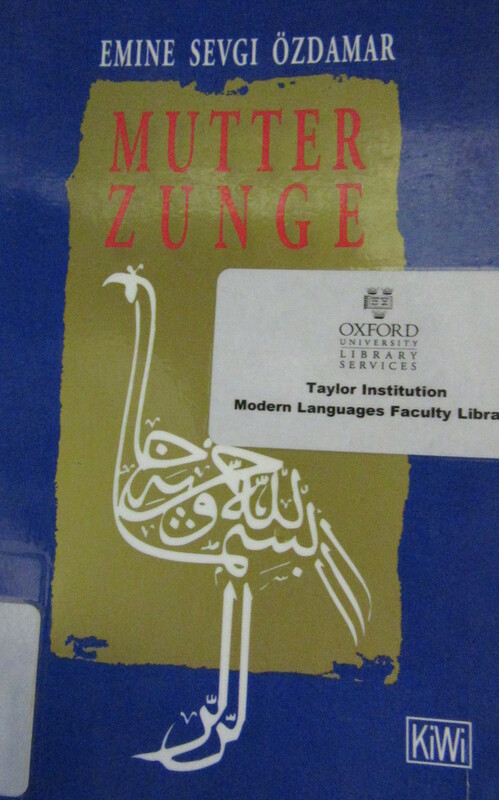 From 1982, she did an MA in German literature at Hamburg University, followed by a PhD at Zurich University. Germany is now her home: after living in Hamburg for 22 years, Tawada moved to Berlin in 2006, where she still lives. She writes in both German and Japanese, with the nature of her bilingualism a prominent feature in her work. Dornseiff, Franz, and Alfred. Gerstenkorn. Der deutsche Wortschatz nach Sachgruppen. 3. Neubearb. Aufl. ed. 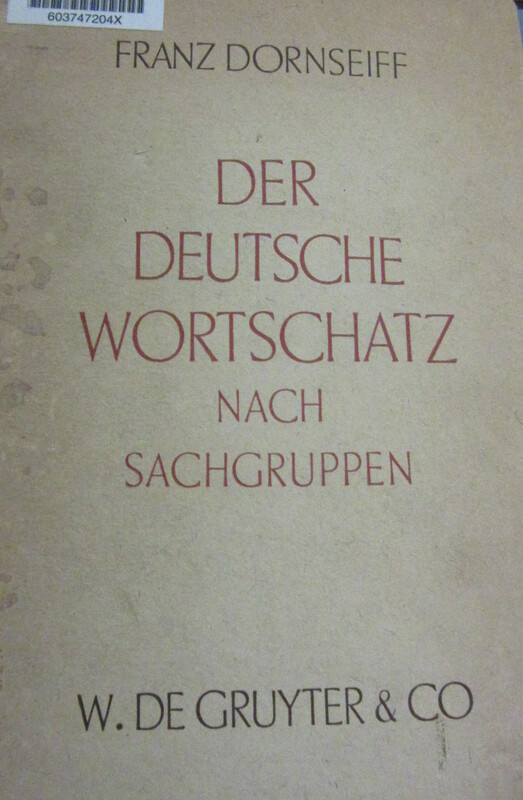 Berlin: W. De Gruyter &, 1943. Kluge, Friedrich, and Elmar. Seebold. 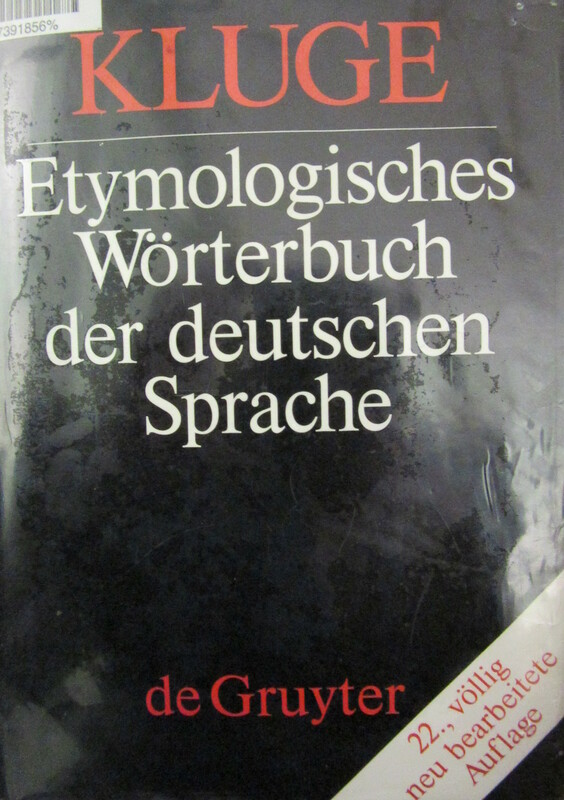 Etymologisches Wörterbuch der deutschen Sprache. 22. Aufl. / Bearb. von Elmar Seebold. ed. Berlin: Walter De Gruyter, 1989. 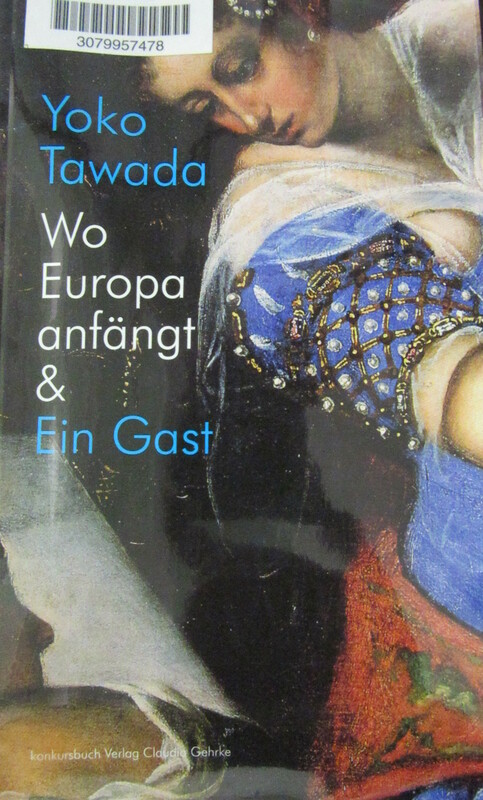 Tawada has won numerous prizes for her work, such as the Adelbert von Chamisso Prize (1996), the Förderpreis für Literatur der Stadt Hamburg (1990), the Lessingförderpreis (1994), as well as numerous Japanese prizes. She was winner of the prestigious Kleist Prize in 2016 (see this extract of the Laudatio by Günter Blamberger given on this occasion). 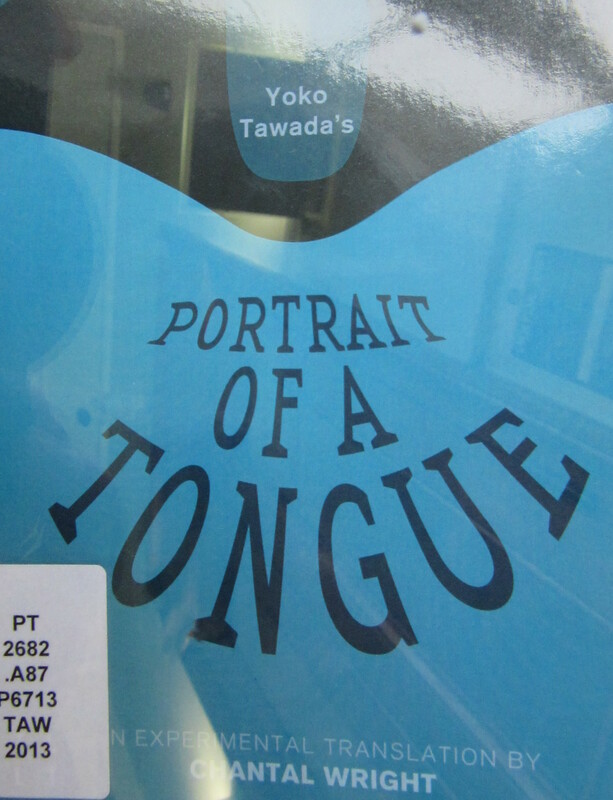 Tawada writes in a variety of genres and media: novels, poetry, essay collections, plays, and even audio texts. 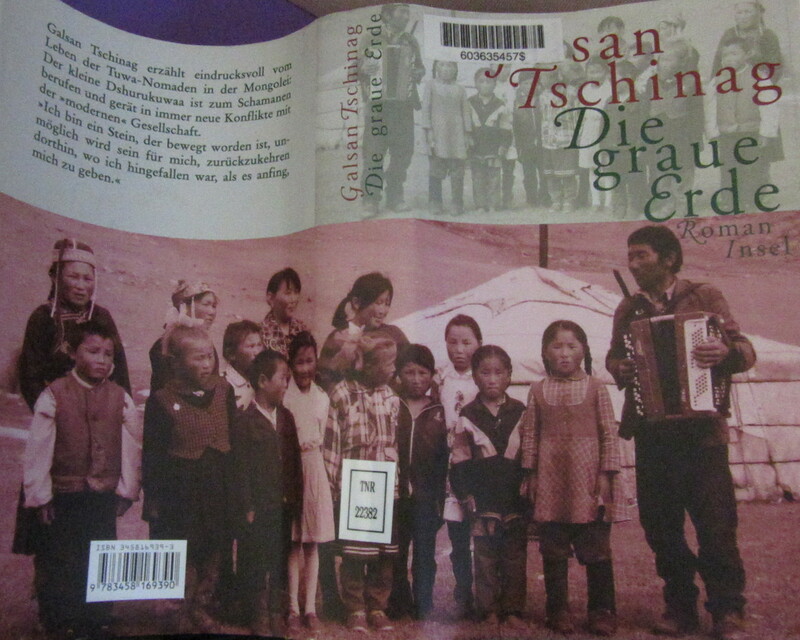 Some of her works are written in Japanese, and then translated into German. Other works are written in German. She rarely translates one language into the other herself, but sometimes writes the same text in both Japanese and German. Some examples of Tawada’s work. Tawada, Yōko. Wo Europa anfängt : Ein Gast : Erzählungen und Gedichte. Tübingen, 2014. Tawada, Yōko, and Peter. Pörtner. 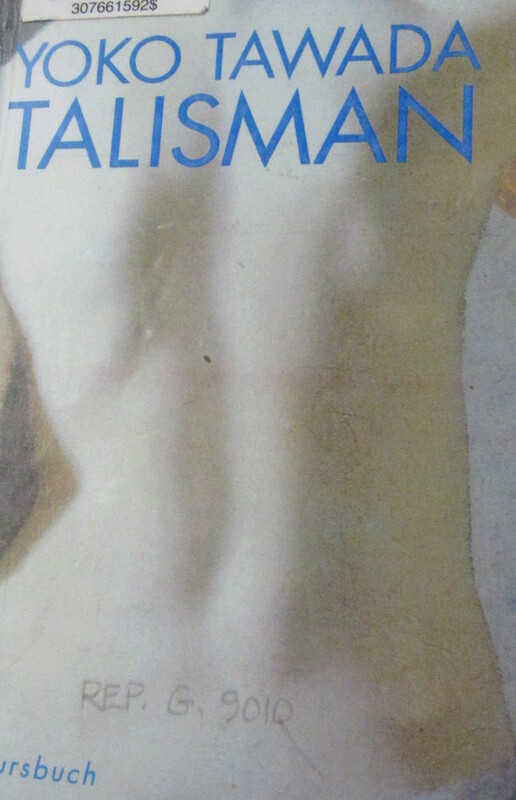 Talisman. Tübingen: Konkursbuch, 1996. Tawada, Yōko. Das nackte Auge. Tübingen: Konkursbuch Verlag Claudia Gehrke, 2004. Tawada, Yoko. Abenteuer der deutschen Grammatik : Gedichte. Tübingen: Konkursbuch, 2010. Of course Tawada is not alone in making use of multilingualism in her writing. 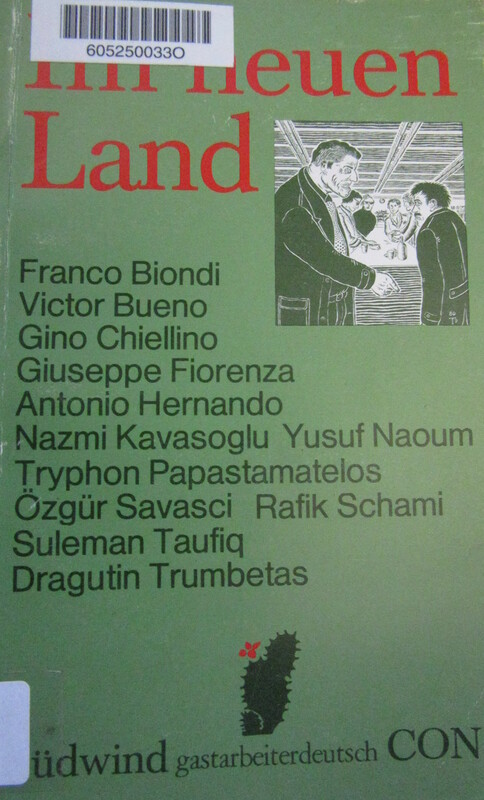 Other multilingual writers writing in German whose works contain the presence of one or more additional languages, include Paul Celan, Franco Biondi, Franz Kafka, Elias Canetti, Galsan Tschinag, Emine Sevgi Özdamar and Tzveta Sofronieva. Galsan, Chinagiĭn. Die graue Erde : Roman. Frankfurt am Main: Insel, 1999. Özdamar, Emine Sevgi. Mutterzunge : Erzählungen. Köln: Kiepenheuer & Witsch, 1998. Biondi, Franco, and Dragutin. Trumbetas. Im neuen Land. Bremen: CON Medien- und Vertriebsgesellschaft, 1980. Celan, Paul., Heino. Schmull, and Michael. Schwarzkopf. Sprachgitter : Vorstufen, Textgenese, Endfassung. Frankfurt am Main: Suhrkamp Verlag, 1996. When making deliberate use of several different languages, the way the languages are presented to the reader is a very important consideration. Layout, choice of typeface and clarity of presentation can all influence how the reader perceives the language and culture in relation to others. 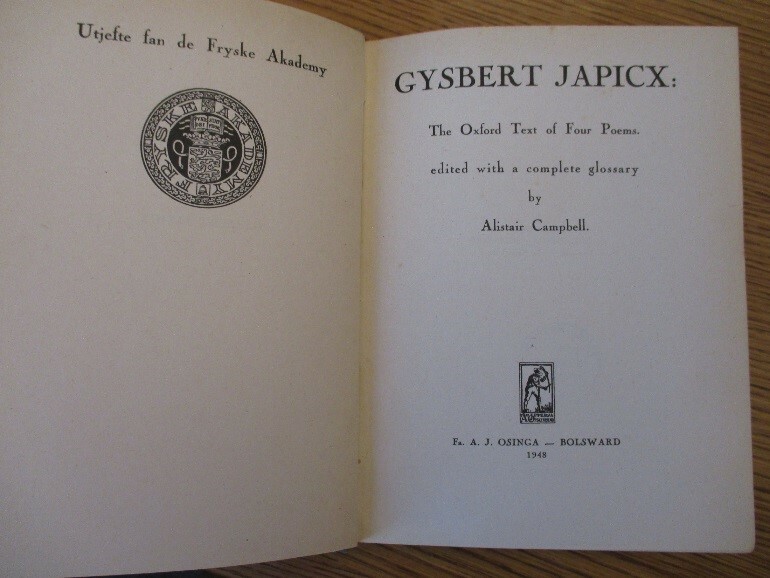 The Taylorian has examples of bilingual books over several centuries. Schottel, Justus Georg. Ausführliche Arbeit Von der Teutschen HaubtSprache/ Worin enthalten Gemelter dieser HaubtSprache Uhrankunft/ Uhraltertuhm/ Reinlichkeit/ Eigenschaft/ Vermoͤgen/ Unvergleichlichkeit/ Grundrichtigkeit/ zumahl die SprachKunst und VersKunst Teutsch und guten theils Lateinisch völlig mit eingebracht/ wie nicht weniger die Verdoppelung/ Ableitung/ die Einleitung/ Nahmwörter/ Authores vom Teutschen Wesen und Teutscher Sprache/ von der verteutschung/ Item die Stammwoͤrter der Teutschen Sprache samt der Erklaͤrung und derogleichen viel merkwuͤrdige Sachen. Abgetheilet In Fünf Bücher. 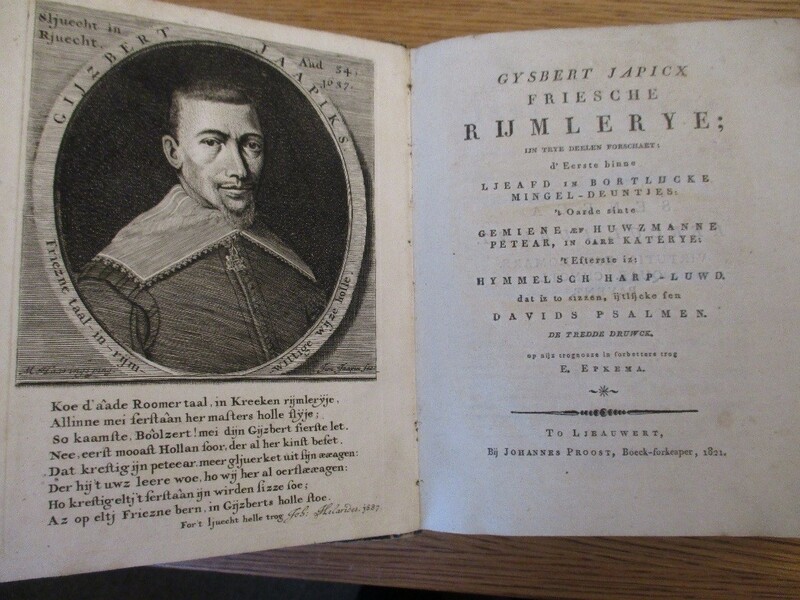 Braunschweig/ Gedrukt und verlegt durch Christoff Friederich Zilligern, 1663. Opitz, Martin, and Esaias Fellgiebel. Des berühmten Schlesiers Martini Opitii von Boberfeld/Bolesl. Opera. Geist- und Weltlicher Gedichte/ nebst beygefuͤgten vielen andern Tractaten so wohl Deutsch als Lateinisch/ Mit Fleiss zusammen gebracht/ und von vielen Druckfehlern befreyet. Die neueste Edition. 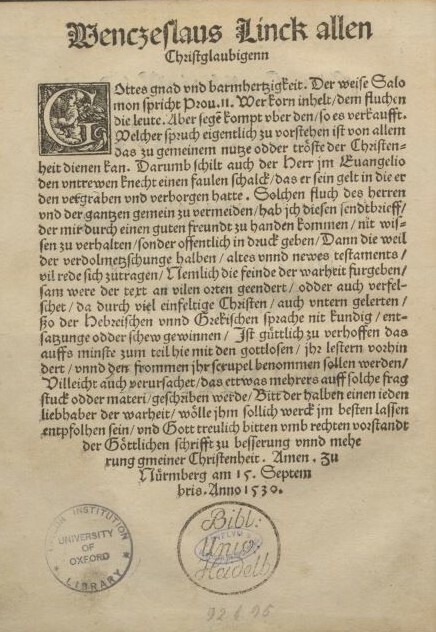 Breßlau: Verlegts Jesaias Fellgibel, …, 1690. 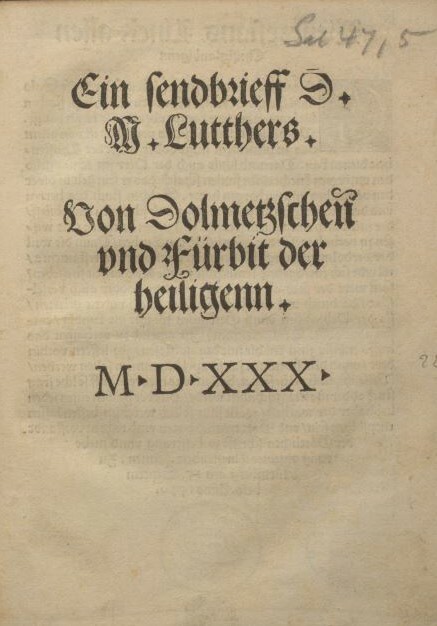 Luther, Martin. Ein Wellische Lügenschrifft/ von Doctoris Martini Luthers Todt/ zů Rom außgangen. Papa quid ægroto sua fata … perfide Papa velis. 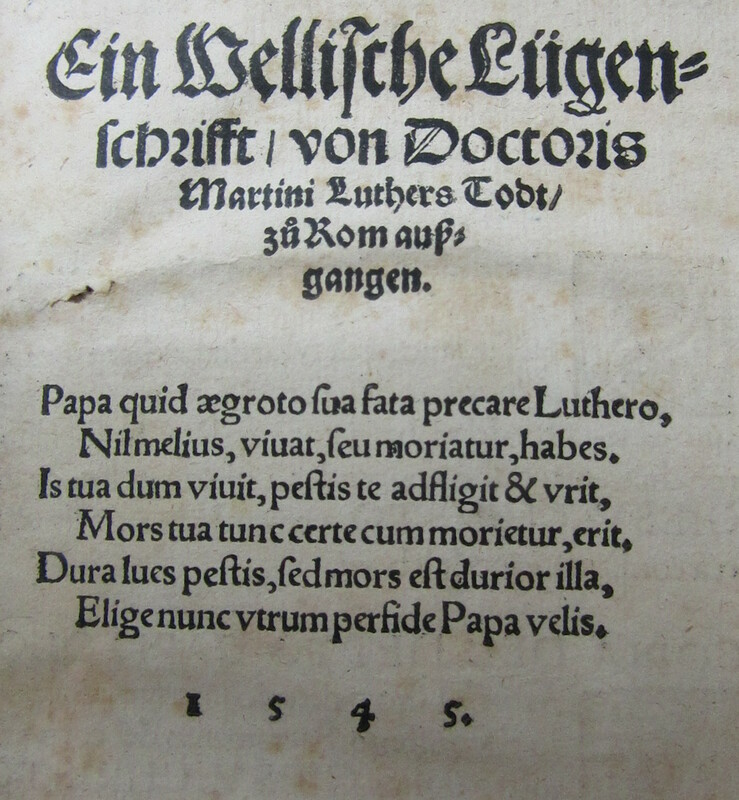 Nürnberg: [Hans Guldenmund], 1545. Clifton, E., Friedrich W. Ebeling, and Giovanni. Vitali. Manuel de la conversation et du style épistolaire : Français-anglais-allemand-italien. Nouv. éd., soigneusement revue et corrigée. ed. Paris: Garnier Frères, 1866. Taylor, Thomas. The Gentleman’s Pocket Companion, for Travelling into Foreign Parts: : Being a Most Easy, Plain and Particular Description of the Roads from London to All the Capital Cities in Europe. With an Account of the Distances of Leagues or Miles from Place to Place, All Reduced to the English Standard. Illustrated with Maps Curiously Engraven on Copper Plates. 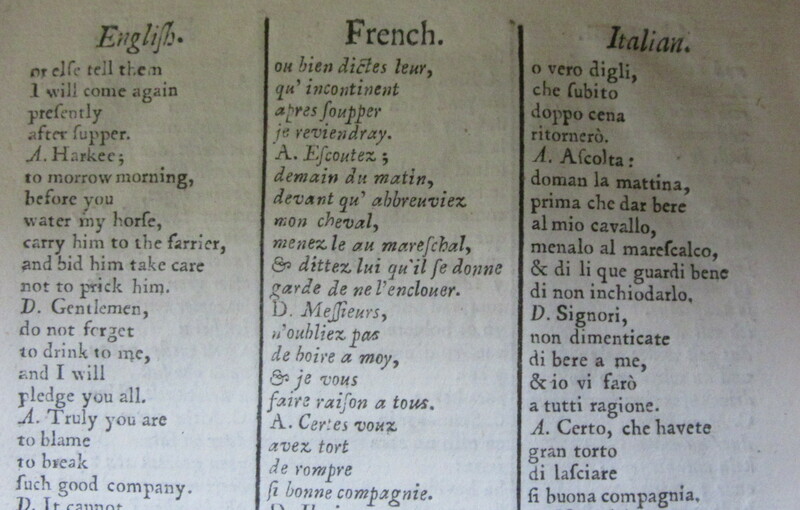 With Three Dialogues in Six European Languages. The First Being to Ask the Way, with Other Familiar Communications. The Second Is Common Talke in an Inn. The Third Other Necessary Conversation. London: Printed and Sold by Tho: Taylor …, 1722. The materiality of the book is a vital aspect of Tawada’s works. She experiments with different forms of paper and other materials in her books. Although paper made from plant-based products has been available since the end of the Middle Ages, Tawada chose to have the book cover of Ein Gedicht für ein Buch made from fish skin, since fish and water are important in her works. 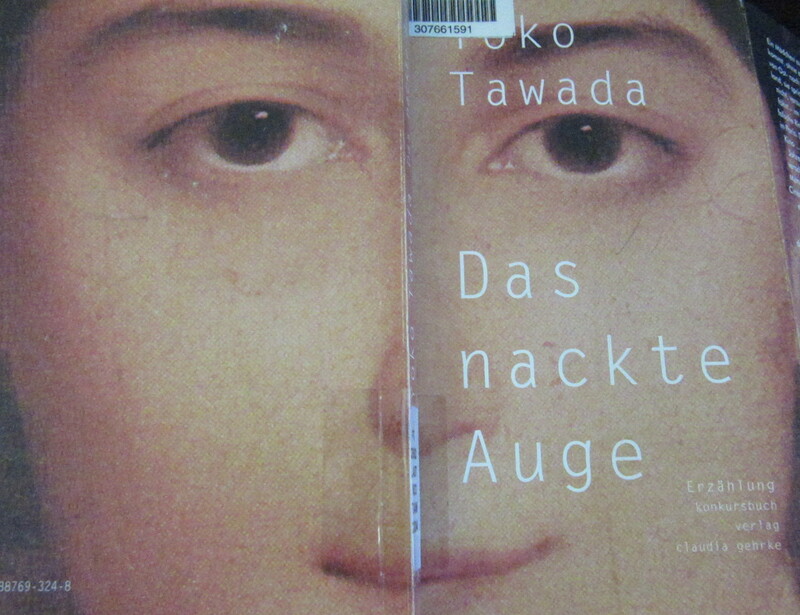 Translating Tawada is undoubtedly a challenge; it often requires a knowledge of both Japanese and German. It poses many ‘problems’: how do we translate neologisms into any language? How do we translate so as to recreate the reading experience of a specific book? For example, in a book that is in German and Japanese, where both languages are to be read in different directions, how is this effect rendered in an English translation? How do we translate into English a German and a Japanese version of the same text? In this text, Chantal Wright outlines the problems and demonstrates potential solutions when translating Tawada’s work. Tawada, Yōko, and Chantal Wright. Portrait of a Tongue. Ottawa, 2013. Tawada’s works make us reconsider our own relationship with language, creating the feeling that no-one can be comfortable in any language, even our mother tongue. Is it possible to free oneself from language? 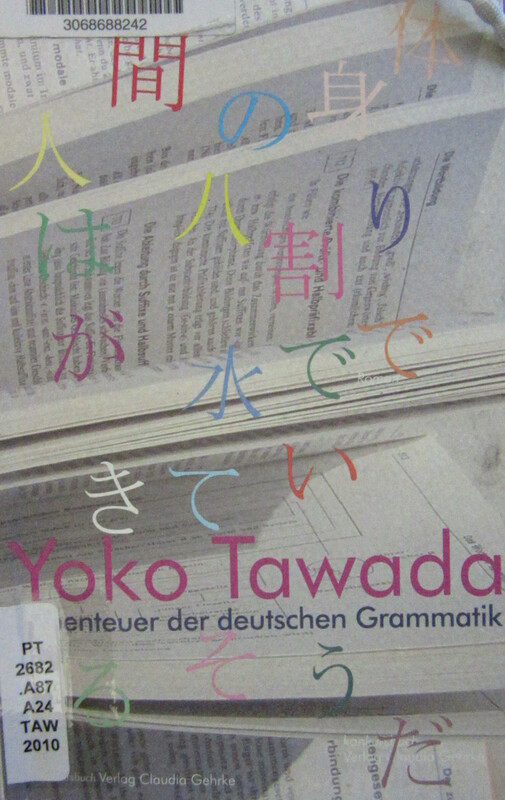 This entry was posted in Collections and tagged bilingualism, exhibitions, German, japanese, translation, Yoko Tawada on 15 February 2017 by ferrarij. 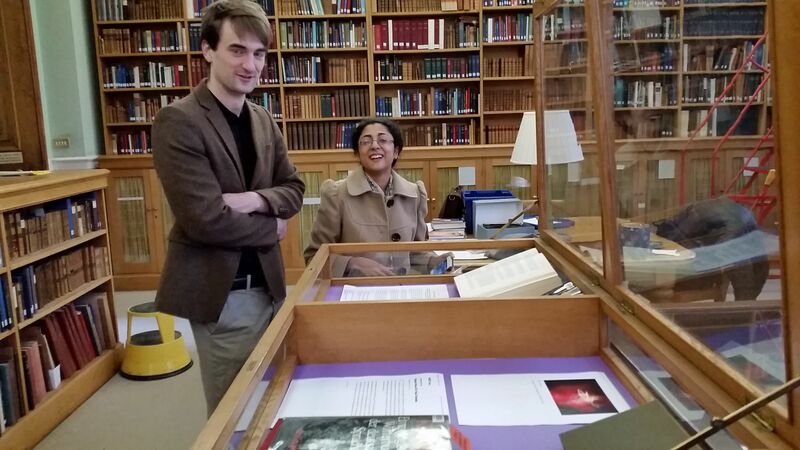 On 12 April, 6pm, Library Graduate Trainee Philippa Taylor pulled off the cover from the display case in the vestibule of the Voltaire Room and revealed to an admiring crowd of linguists, librarians and literature lovers four versions of Shakespeare’s ‘Tempest’: a Portuguese translation printed in Lisbon in 1977, Aimé Césaire’s adaptation pour un théâtre nègre from 1969, the typescript of the only Frisian translation with commentary extant and, as crowning piece, a wonderfully atmospheric large colour print from a French artist’s book based on the translation by A. du Couchet. 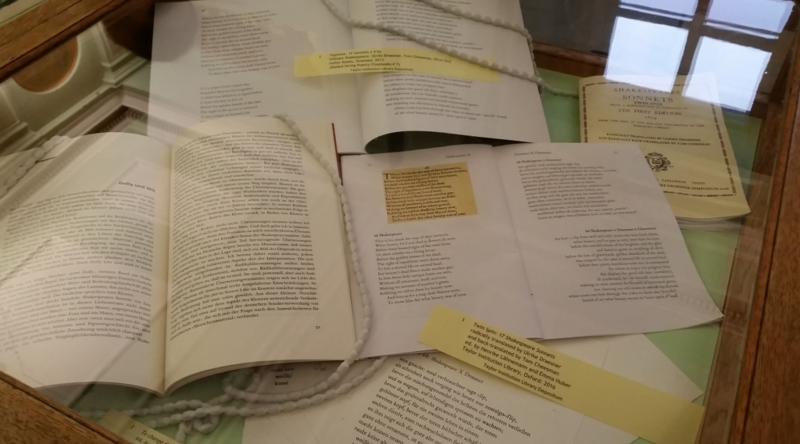 The Tempest arrangement forms the final case in a new exhibition in the Taylor Institution dedicated to Shakespeare in translation. The idea for putting this on was sparked by the lucky coincidence of a symposium on Ulrike Draesner, Writer-in-Residence at the German Sub-Faculty in 2015-16, and the Shakespeare 2016 events going on in Oxford. A few years ago, Ulrike had published her “radical translations” of 17 Shakespeare sonnets, set in a post-modern world of reproduction not via nature as in Shakespeare’s sonnets but via cloning. This had inspired German lecturer, translator and poet Tom Cheesman to venture a back-translation in which he “Englished” her versions again. 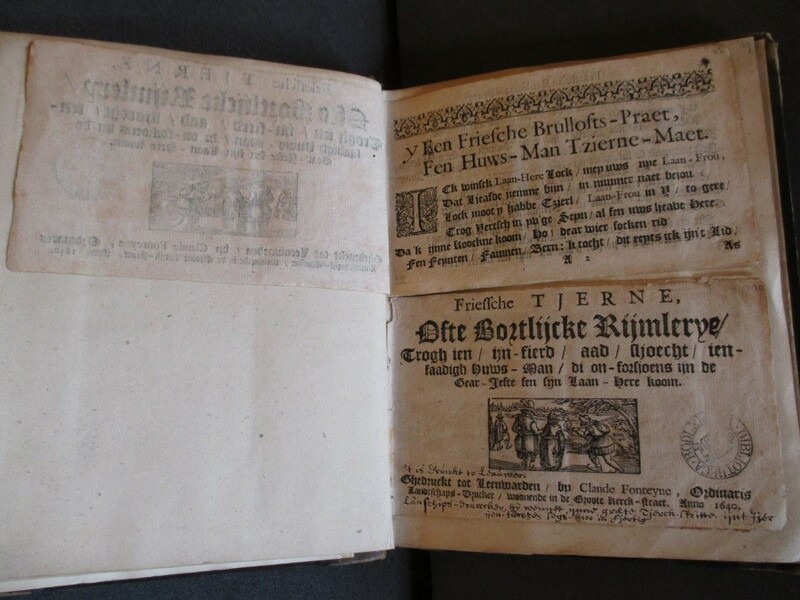 Emma Huber as German Subject Librarian and Henrike Lähnemann as Professor for Medieval German, working together on the Reformation 2017 project, were just looking for a test case to trial a new form of library booklet as print-on-demand. 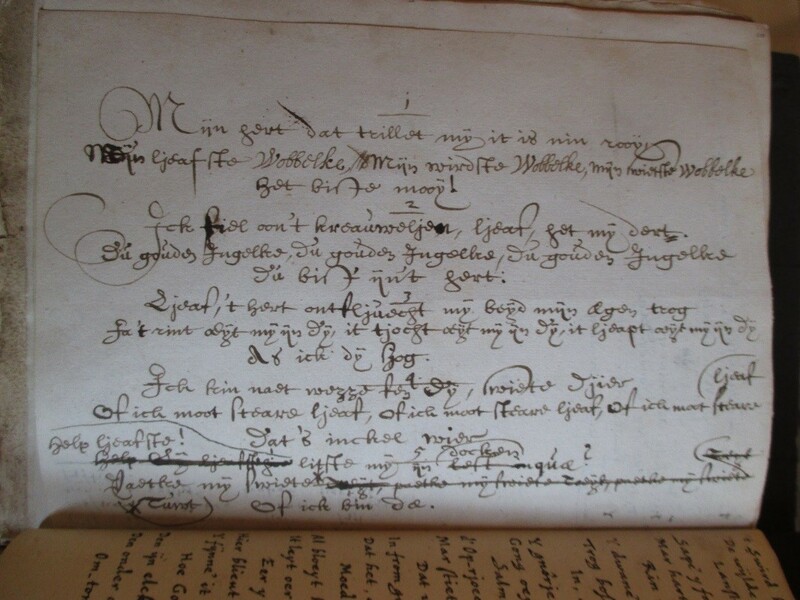 They both thought that this would be the perfect copy: Shakespeare – put into German – returned to English in a literature-generating movement characteristic for Modern Languages in dialogue. 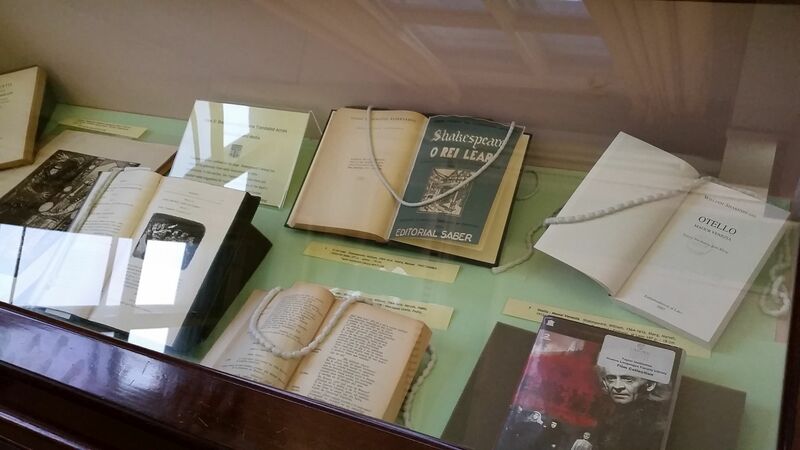 The exhibition spirals out from the display cases in the centre of the Voltaire Room. 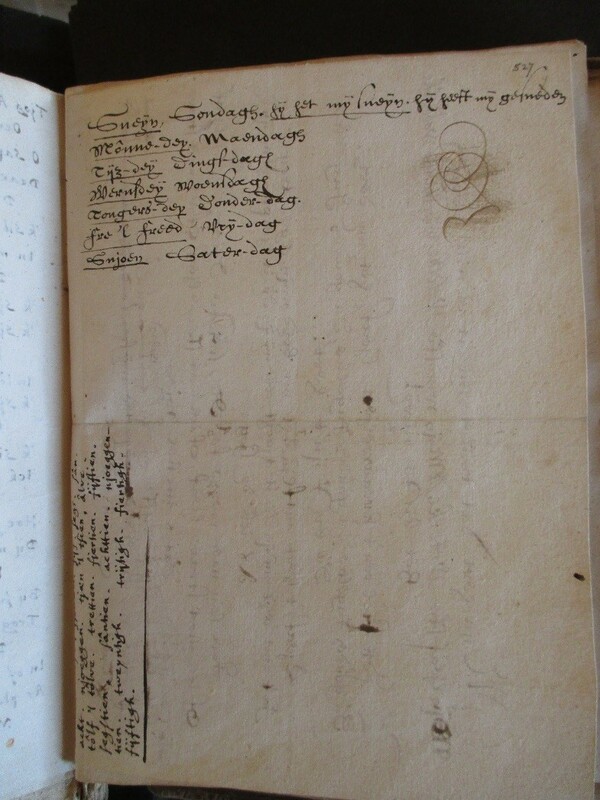 Standing high, the oldest cabinet which has seen many a distinguished publication from first editions to brand new research publications shows the genesis of ‘Twin Spin’, the Shakespeare x Draesner x Cheesman sonnet version. 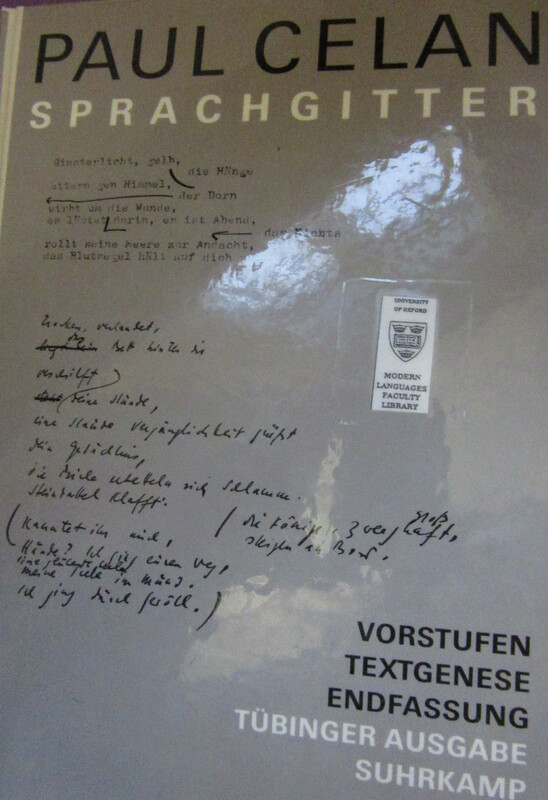 The largest cabinet next to it is needed to show at least a fraction of the over 180 attempts to render Shakespeare sonnets in German, starting with Dorothea Tieck’s take on it as part of the classic ‘Schlegel-Tieck-Ausgabe’ which made Shakespeare – at least in the eyes of nineteenth century Germans – a truly German author. A special focus is on the early 20th century bibliophile versions of Stefan George and Friedrich Huch, which provide an eye-catching display in contrast to the typescript aesthetics of the 1980s and 1990s, when Shakespeare was in vogue with the likes of the singer-songwriter Wolf Biermann. Spiralling outward from the central cabinets are two cases crammed with again just a small selection of sonnet translations into other European languages, from Sorbian to Yiddish, emphasising – as an Italian dissertation on display claims – that Shakespeare speaks ‘da poeta a poeta’. The rich material on literary engagement with Shakespeare is then taken beyond the sonnets in samples of translations of his plays across the languages – and across the media to visual material and DVDs. 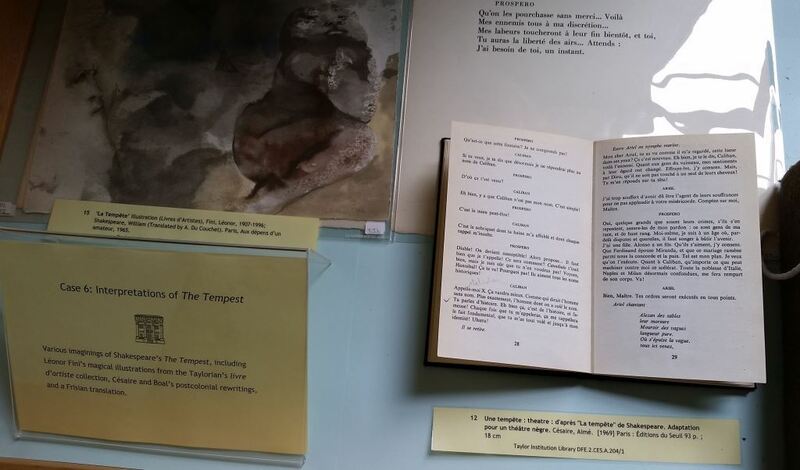 The Tempest display case mentioned at the beginning provides a final case study of how much more could be explored. The exhibition was curated by Henrike Lähnemann (Professor of Medieval German Literature and Linguistics), together with Emilia Henderson and Philippa Taylor and the help of the Taylor Institution staff. Special thanks go to Lydia Pryce-Jones who designed the cover image, to Emma Huber for master-minding the operation, and to Clare Hills-Nova for her curatorial expertise! So this is an exhibition that invites visitors on a journey to discover more of the astonishing treasures of the Taylorian while engaging with Shakespeare. The catalogue of the exhibition can be downloaded here; the full edition of ‘Twin Spin’ can be bought in the Taylorian at the Issue Desk or ordered from online retailers (ISBN 978-0-9954564-0-2). This first pamphlet from the Taylor Institution Library is published on the day of Shakespeare’s 400th death day, showing that he is very much alive – not least through the constant renewal in translation. 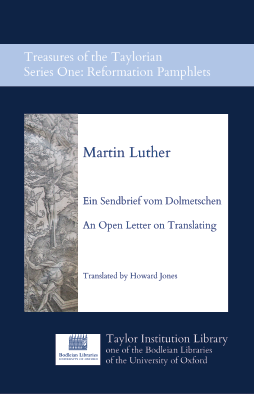 This entry was posted in Collections and tagged exhibitions, Reformation, Shakespeare, sonnets, translation, Ulrike Draesner on 21 April 2016 by Dan Q.